The American football season kicks off tonight and Intertops.com, the first to ever take an online wager and still the most trusted online sportsbook anywhere, has a complete line-up of NFL odds and props, as well as a deluxe trip to Super Bowl XLIV in Miami to give away. Monthly No-Juice NFL lines begin with Thursday’s league opener. Throughout the regular season, players at Intertops.com will be automatically entered in a free contest to win a dream trip to the Super Bowl in Miami, Florida next February whenever they place a wager on any NFL bet offer. The prize includes flights to Miami, four nights at a top hotel, and top tickets for Super Bowl XLIV. 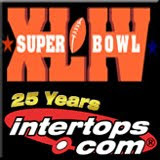 Intertops will also send two more football fans to the college football BCS Championship. Apparently seriously struck by Super Bowl Fever, Intertops is also forfeiting its margin and offering one NFL No-Juice line each month. After tomorrow’s Tennessee Titans vs Pittsburgh Steelers game, the next No Juice NFL Lines will be when the Green Bay Packers take on the Minnesota Vikings on October 5th. Super Bowl is always the biggest sports betting event of the year and the excitement starts building with the first kick-off each September. Anything can happen as the NFL season unfolds, but right now Intertops oddsmakers seem almost certain the New England Patriots will be going to Miami next February, favoring their opponent to be the New York Giants (20.0) or the Philadelphia Eagles (23.0). Complete and current NFL betting propositions are always available at: www.sportsbook.intertops.com. Intertops.com, which also offers poker and casino games, takes pride in its long record of quick, hassle-free deposits and withdrawals and excellence in customer service.